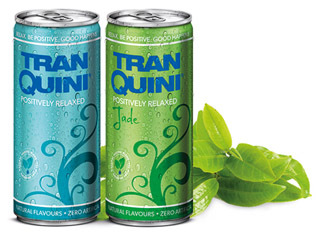 Born in the beautiful high Alps and rivers of Austria, TranQuini® epitomizes the image of relief you look for in a refreshing, revitalizing and calming drink. Even their tagline Positively Relaxed is prominent on all their packaging to help drive this message home. Tranquil or tranquillity image – a perfect name with an international flavor that travels well across the globe and nestles in well throughout Europe, mingling among roots from all the romance languages – tranquilo(a), tranquilidad, (Sp. & It.) or tranquille(Fr.) where the mountains kiss the Mediterranean shorelines. This product name is so easy to pronounce and remember, even though it is a coined word. The drink has such a smooth name, that easily rolls off the tongue. Indeed, a memorably named new drink. I wonder if it tastes as good as it sounds! Full of herbal extracts, tasty teas and natural fruit juices oozing with Vitamin B12 it delights, excites and re-enhances your positive energy levels while encouraging relaxation. 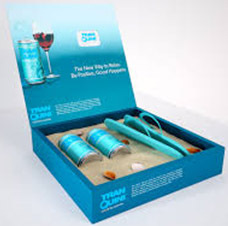 Thus, it is a very clever marketing ploy that they package two cans in a gift box with a pair of flip-flop sandals, that silently shouts “beach time – let’s go unwind.” The alliteration expands more with the thought it creates of Tranquini – bikini time. This is where a blend of product naming doesn’t fall far from the apple tree – the company name! Now this is a very interesting angle; you wish to promote an event or have a business(one 'man' or corporate) and want to promote your products or services. This is a novel outlet to get your business out there in less than the 30 second elevator pitchNow this is a very interesting angle; you wish to promote an event or have a business(one 'man' or corporate) and want to promote your products or services. This is a novel outlet to get your business out there in less than the 30 second elevator pitch..
Costa Woman online – something for every woman living in Spain.